An Marie is home-based at DeBell Golf Course where she offers private, semi-private and group lessons to golfers of all ages and levels. She also teaches at various LPGA Lesson Zones, LPGA Golf Clinics for Women and Get Golf Ready classes. Whether you are a new, intermediate or advanced golfer, you will benefit by having a coach to guide you to more efficient motion and routines in order to improve and enjoy the game of golf. Private instruction is the most efficient way to learn and improve your golf game and to effectuate your swing technique. Group lessons combine learning with fun and a good choice if you are just learning the game. Includes green and cart fees. Instruction includes hitting shots from various lies, course management, pre- and post-shot routines, mental aspects of the game, golf etiquette and golf rules. 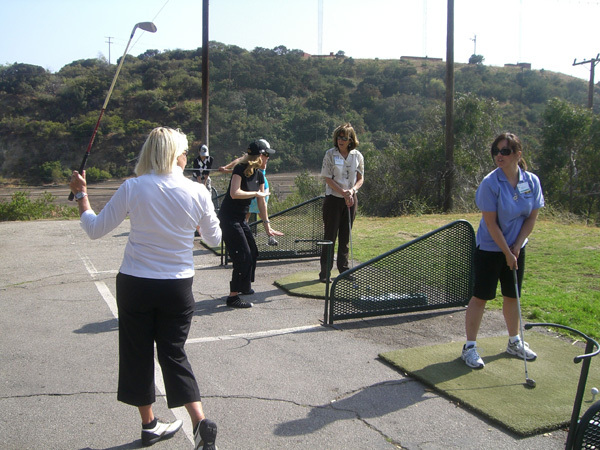 PRIVATE INSTRUCTION COVERS ALL ASPECTS OF THE GAME AND WILL BE PERFORMED IN PRACTICE AREAS AND / OR ON THE GOLF COURSE. ALL GOLF INSTRUCTION PRICES INCLUDE VIDEO SWING ANALYSIS AND VISUAL FEEDBACK.